In a food processor roughly chop anchovy filets, olives and capers. In a pan warm the butter with olive oil and sauté the garlic cloves. Add all the chopped ingredients, anchovy filets, olives, capers and tomatoes; stir and cook slowly for 15 minutes. Season with pepper. Boil the pasta in plenty of water according to the manufacturer's instructions. Drain, top with the sauce and sprinkle with parsley. 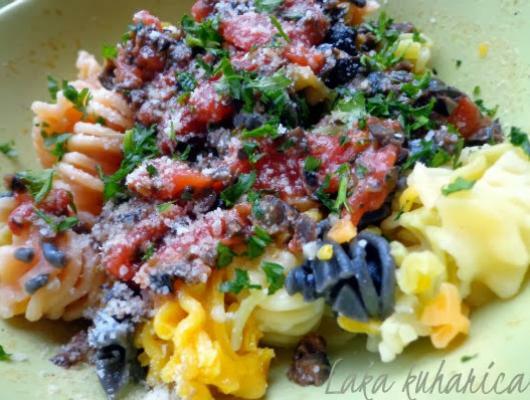 A tangy and somewhat salty popular Italian pasta dish.